This infographic on digital disruption highlights the key results from the German digitisation consumer report 2014 published recently by Roland Berger Strategy Consultants. 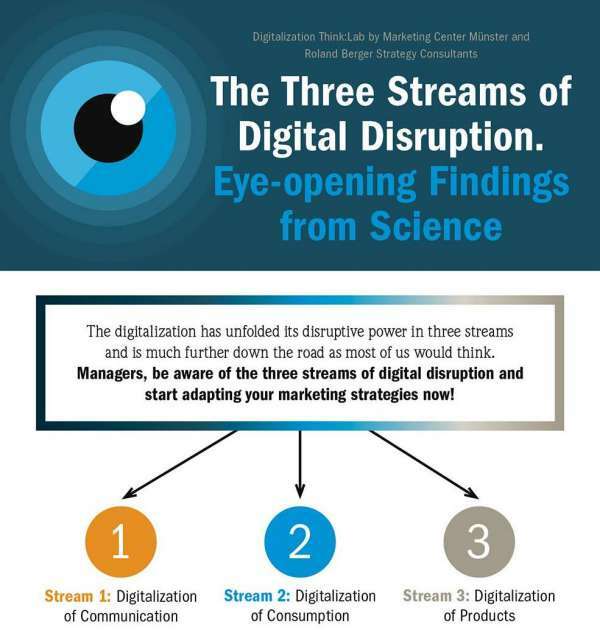 To support the recent launch of their German digitisation consumer report 2014, the Roland Berger team put together an infographic entitled ‘The Three Streams of Digital Disruption‘. You will find below 10 top insights on digital disruption. Please find below an infographic highlighting the three streams of digital disruption. The study emphasises the importance of providing an excellent and consistent digital customer experience on mobile and online, the value of capturing and leveraging publicly the voice of the customer and how real the concept of ‘Zero Moment of Truth‘ introduced by Google back in 2011. This Roland Berger infographic does a good job summarising the top insights and trends driving the Digital Disruption and highlighting both the top areas of your customer engagement strategy and the top tech you might want to invest in as a priority.